By the time we come to the third and the last battle the demons get more complex and subtler. We move away from battles fought on the base level of our nature and the gross material plane of our existence to a battle fought on the mental plane. This time the chief demons are Sumbha (“I” or “Me”, the pseudo-self) and Nisumbha (“Mine”, the attachment we feel). This myth too has a familiar beginning. Two demons, named Sumbha and Nisumbha, have dispossessed the gods, stripped them of their powers and appropriated their wealth and privilege. Sage Medhas proceeds to tell the third and the last story to the King and the merchant who wish to know about the Devi. And so they sing to her, the Devi, who is the illusive power of Vishnu. Hearing their praises Parvati who had come there to bathe in the waters of the Ganga enquired of the gods, Who is she that is being extolled here? Hearing her question the goddess Ambika sprung forth from Parvati’s body sheath (kosha) and spoke, it is me they sing to. Parvaati recognised the goddess as a projection of herself and was reminded of who she was. Chanda and Munda, the servants of Sumbha and Nisumbha, who were passing by, saw the dazzling form of Ambika and rushed inform Sumbha. ‘You own all that is precious and beautiful so why is this jewel among women not been taken by you?’ they asked him. ‘Would you dare challenge the most powerful of demons to a battle?’ Chanda Munda roared. Her reply reached Sumbha who commanded his general Dhumralochana(one of smoky vision) to bring this woman to him. On hearing her words, Dhumralochana rushed towards her and Ambika reduced him to ashes by a mere heave of her breath (hum). Seeing Dhumralochana turned to ashes, the enraged army of demons showered on the Goddess sharp arrows, lances and battle-axes. Then the lion, the mount of the Goddess, shook its mane in anger and roaring most terrifyingly, pounced on the army of asuras. It slaughtered some demons striking with its paw, tearing out the bellies of some with its claws, others with its mouth, and some by a stampede with its hind legs. In a moment, the entire army was destroyed. When the news of Dhumralochana’s death reached Sumbha he sent Chanda and Munda with a large army to get her. The asuras saw the Devi, smiling gently, seated upon a lion on a lofty golden peak of the great mountain. Bewitched by her beauty they rushed to capture her. Angered, Ambika frowned and the terrifying Kali armed with a sword and noose, emerged forth from her forehead. Holding a strange skull- topped staff, decorated with a garland of skulls, clad in a tiger’s skin, very appalling due to her emaciated body, with a gaping mouth and tongue lolling out fearfully, with deep-sunk reddish eyes, she filled the quarters with her roars. Crushing the asuras she devoured them. Chewing them most frightfully with her teeth, she pounded the entire army of the mighty wicked asuras. Laughing fiercely, Kali then mounted the great lion and rushed at Chanda and seizing him by his hair, she severed his head with her sword. Seeing Chanda being slain, Munda also rushed to attack her. Striking him furiously with her sword, she felled him too to the ground. When Chanda and Munda were laid low and many of the battalions of the asuras destroyed, the lord of the asuras, the mighty Sumbha, with intellect clouded by rage, commanded the marshalling of all the asura armies. Seeing the most terrible army advancing, Chandika filled the space between the earth and the sky with twangs of her bow-string. Thereon her lion roared very loudly. Ambika amplified those sounds with the clanging of the bell. Filling the quarters with roars from her gaping mouth, Kali suffused the sounds of the bow-string, lion and bell by her terrific roars. Then there issued forth, endowed with exceeding valour and strength, Shaktis from the bodies of Brahma, Shiva, Guha, Vishnu and Indra, Whatever was the form of the Godhead, whatever his ornaments and vehicle, in that very form his Shakti advanced to fight the asuras. on to the ground than a great asura of his very stature would spring forth from the earth. As many drops of blood fell from his body, so many asuras came into being and they too fought with the Mother-goddesses. Hit by a multitude of weapons the great asura lost all his blood Raktabija eventually fell on the ground. After Raktabija was slain and other asuras were killed in the fight, the asura Sumbha and Nisumbha gave way to unbounded wrath. 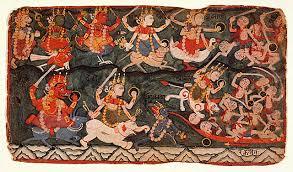 Then commenced a bloody combat between the Devi on one side and, Sumbha and Nisumbha on the other. 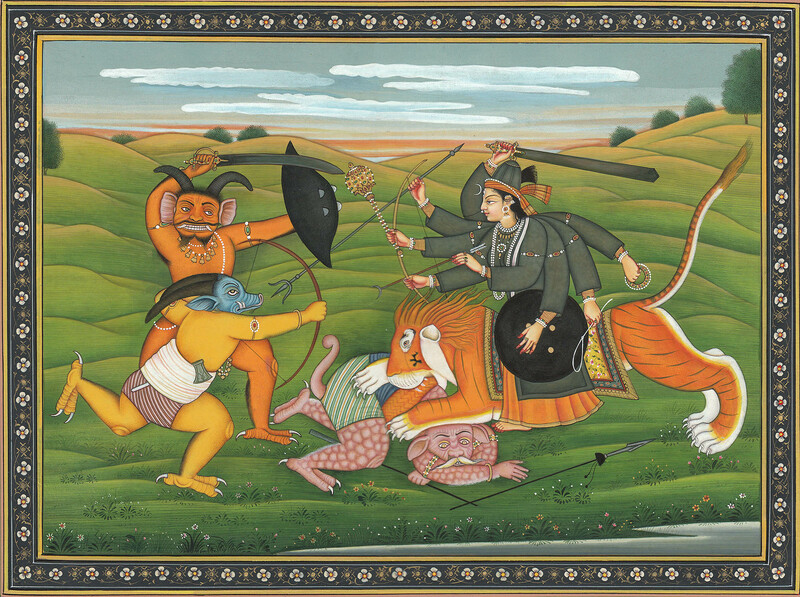 In hundreds and thousands the Goddess and the asuras split the arrows shot by each other. Finally Chandika struck Nisumbha with a spear and killed him. The Goddess replied, ‘In this universe, I alone exist. Who else is there besides me?’ Hearing her words all the matrikas headed by Brahmani merged in the body of the Goddess. Then Mother Ambika alone remained. Ambika destroyed Sumbha’s weapons one by one, then his horses, chariot, bow and mace. Then the Goddess hit him on the chest. Wounded by the blow of her palm, the king of asuras fell to the ground. Rising up again he leapt up towards the sky and seized the Goddess. Sumbha and Durga fought as never before, wrestling with each other in the sky. Eventually the Goddess chucked him down to the earth and pierced his chest with a spear. With the wicked ones slain, everything became clear and propitious once again and the universe regained its original state of perfect peace. Here ends the last tale. The Gods overjoyed, thank the Goddess and she in return promises to come to their aid whenever needed. This constitues the fourth hymn and is the known as Narayani Stuti. This is a battle fought in the mind. The Asura kings Sumbha( Ego) and Nisumbha(attachment) along with their generals Chanda (pra-vrtti or extraverted psychic energy), Munda (ni-vritti or introverted psychic energy), Dhumralochana (distorted perception) and Raktabija (incessant compulsive thought processes), are a formidable force to reckon with. In the battle, innumerable demons proliferate from Raktabija’s spilt blood, terrorising and bewildering the gods. This is the nature of citta vrttis or thought processes. Each thought leads to more thoughts. The Devi’s battle sequence with the asura brothers is the inner conflict between the boundless Self and the limited sense of self. Being inextricably linked the two demon brothers ‘me’ and ‘mine’ fight, one rising up when the other is knocked out. If it is not ‘Me’ then it is about ‘My’ children, spouse, family or country or religion. But in the final reckoning, all this is of little value. The image of grinding teeth that is invoked thrice (7.11, 7.13, 7.15) reminds us of the wheel of Time (Kalachakra) that grinds all things to dust. Except for a change of gender, Kali is none other than Kala, Time. Understanding and overcoming these subtler demons requires a luminous, benevolent and beautiful manifestation, one that can enlighten and liberate. This is the manifestation as Maha Sarasvati. Unlike the slayer of Mahishasura who is the collective embodiment of the divine anger or divine rajas of all the gods, Kaushiki is a Sattvic manifestation.